When I decided to intern with a non-profit organization I googled, “local sustainable brooklyn,” and that big wide web introduced me to Sustainable Flatbush. I had already searched a number of groups whose websites seemed too impersonal, too big, too far, or too bureaucratic. Then this delightfully designed web-page revealed itself with an unmistakably local and personal character. Digging into the links, Sustainable Flatbush impressed me with its involvement in such varied activities. 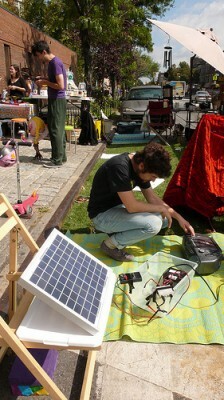 I had considered interning with a solar power organization, or applying to Transportation Alternatives (fat chance? ), but their aims are quite specialized, and though fascinating, would only provide me with a narrow scope of the work in their department. But following Sustainable Flatbush’s links I quickly knew all my interests were met. The range was wide, and the depth was varied: worm composting demonstrations for children, composting potlucks and tutorials for adults, urban gardening and vegetable growing, organization of community events like environmental fairs, Park(ing) Day, solar energy forums, and community bike rides promoting transportation alternatives, partnerships and contact with all kinds of smaller and bigger non-profits, links to recycling… a perfect synthesis of all the interests and concerns I harbor in the 21st century. Even more, contacting them was easy, and Anne Pope’s reply was unlike any other I’d received. Previous responses were curt and to the point, businesslike and impersonal, demanding only a CV. Instead, Anne, the director of Sustainable Flatbush, seemed thrilled, asking about my hobbies, education and general interests, meaning about me and not about what I have accomplished on paper. This felt nice, and though I feel accomplished “on paper”, it strikes me as impersonal and insufficient as a summary of self. I finally met with Anne in late August and accompanied her to a meeting with her colleagues. Diving right into the non-profit institution, I was caught off guard. The people: everything from what is an advisory board, its responsibilities and powers, who actually comprises it in this case, the volunteers, who to thank for the website (Keka), who stewards the garden? The politics: the sources of funding, how to appropriate them, when to ask and for which events? The non-profit: how to declare it and how to run it? The community: how to communicate, receive ideas, make decisions, give answers, accommodate constituents? All in all, a fascinating and endless list of how a seemingly small and local organization copes with complex questions and negotiates its purpose in a local context. A week or so later we were in the midst of preparing for the Flatbush Frolic as Sustainable Flatbush was hosting the Environmental Fair at the function. This was my first experience writing for the public, promoting an event to a community, and it’s a lot more work than it seems. I spent the day writing and rewriting the blurbs and press releases for our upcoming events. I was becoming overwhelmed and flustered, but by the end of the day a deep satisfaction set in when the script was deemed worthy and catapulted through the virtual world. I was now prepared to actually attend the events that I had researched and written about for days! The Environmental Fair at the Flatbush Frolic was my first time witnessing Sustainable Flatbush interacting with the community at large. Parents and kids were under our tent all day long, squealing at the worms and learning about composting, farmshares and solar energy, as well as our own role and initiatives in the neighborhood. I met many active community members from the Food Coop, the urban garden, Transportation Alternatives, and more. I talked to neighbors who garden for a hobby in an attempt to acquire some rooftop and urban gardening tips, had discussions about the international politics of aid, food production, climate change, city transport and bicycling. I left with a tangible connection to Flatbush in my hand through meeting the folk that live in and care for the neighborhood. 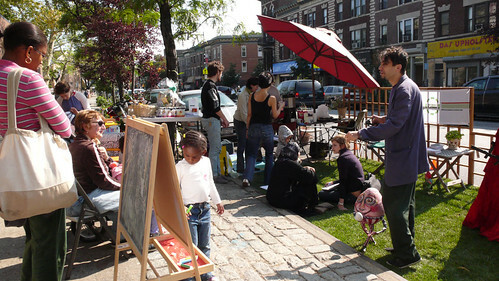 The following Friday was the celebrated Park(ing) Day! Imagine real grass on the street, a park instead of a car, a puppeteer, free coffee and tons of kids having a blast with fingerpaints, music and the creativity of recycled art projects. We surprised many the unsuspecting community member on their way home from work or to the store, who stopped by to ask about the scene. Most left interested and pleased, with a smile on their face, musing about the conversion of space form parking spot to a community’s open space. We reached out to a lot of new and interested people, letting them know who we are and what we care about. These face to face community events bring sense to the days I spend writing and editing the virtual posts that go out to people I don’t even know, like our neighborhood blogs, news sources, and email contact list. Little by little I am actually meeting these people and putting their specific smiles together with their blogs or email addresses, and it feels strange and pleasant at the same time. The community takes shape in this way beyond the contours of its geography on the Brooklyn map, beyond the virtual realm of the web, from the nebulous to the interpersonal and real. And it is this abstract shift which occurs almost imperceptibly that I have come to like the most about my internship. It does indeed prove the feasibility of the seemingly intangible and elusive aims to which this small organization dedicates its time and energy, and continues to give me enthusiasm for our upcoming work.